President Donald Trump hinted that he could hit the campaign trail with musician Kanye West, in a Thursday morning interview on Fox News. “I could see it, I could see it,” Trump said. The president defended Kanye as a friend of his and reacted to his alleged claim that he was bullied on the set of Saturday Night Live for wearing a “Make America Great Again” hat. “He has been a friend of mine. I’ve known him a long time. He’s a very different kind of a guy, I say that in positive way. He is a very different kind of a guy. 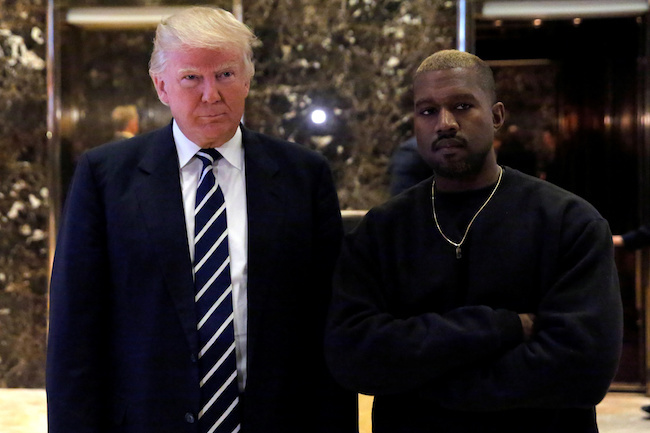 Those in the music business say he is a genius,” Trump said, adding that his poll numbers with African Americans went up after Kanye supported him. “When Kanye came out couple months ago, something happened, my polls went up 25 percent. Nobody ever seen it. He has a big following in the African-American community. A big, big following,” he continued. Trump is scheduled to have lunch with West on Thursday at the White House. “Kanye West is coming to the White House to have lunch with President Trump, and he will also meet with Jared Kushner. Topics of discussions will include manufacturing resurgence in America, prison reform, how to prevent gang violence and what can be done to reduce violence in Chicago,” White House press secretary Sarah Huckabee Sanders said.